Lost in the media scrum about threats and counter threats from President Trump and North Korea is a very important story that was totally missed. While headlines a few days ago blared that North Korea said it would never negotiate with the US on its nuclear and missile programs, in fact, it never said that. This isn’t the first time the media missed the story. It happens all the time, whenever it covers statements by North Korea. A big part of the blame goes to Pyongyang. It’s incredibly hard for anyone to parse its public policy statements, often filled with bluster, bluff and just plain old propaganda. It is hard for anyone except the most experienced North Korea hand to figure out the real message—if there is one. But, with that caveat the news media has a responsibility to get the facts straight. And on this story, it failed completely. That failure is particularly dangerous given the continuing mounting crisis between Washington and Pyongyang. We will, under no circumstances, put the nukes and ballistic rockets on the negotiating table. Neither shall we flinch even an inch from the road to bolstering up the nuclear forces chosen by ourselves, unless the hostile policy and nuclear threat of the U.S. against the D.P.R.K. are fundamentally eliminated. 미국의 적대시 정책과 핵위협이 근원적으로 청산되지 않는 한 우리는 그 어떤 경우에도 핵과 탄도로케트를 협상탁에 올려놓지 않을 것이며 우리가 선택한 핵무력 강화의 길에서 단 한치도 물러서지 않을 것입니다. Indeed, this formulation just repeats earlier statement by Kim Jong Un himself (on July 4) as well as an official North Korean government statement on August 7, which is an authoritative policy pronouncement. But no one in the media mentioned either of these statements in their coverage. In short, the North Koreans appear to be saying that the only way they will put their WMD programs on the table is if the US threat to their country ends, a very different position than described in media reports. 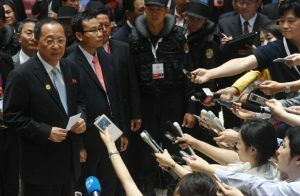 We can argue whether the North Koreans are “sincere” about negotiations and of course whether talks can work, but first we need to get our facts straight. In this case, the media did a disservice to us all.